And some people use shed skins to laminate as art on their fingernails too. 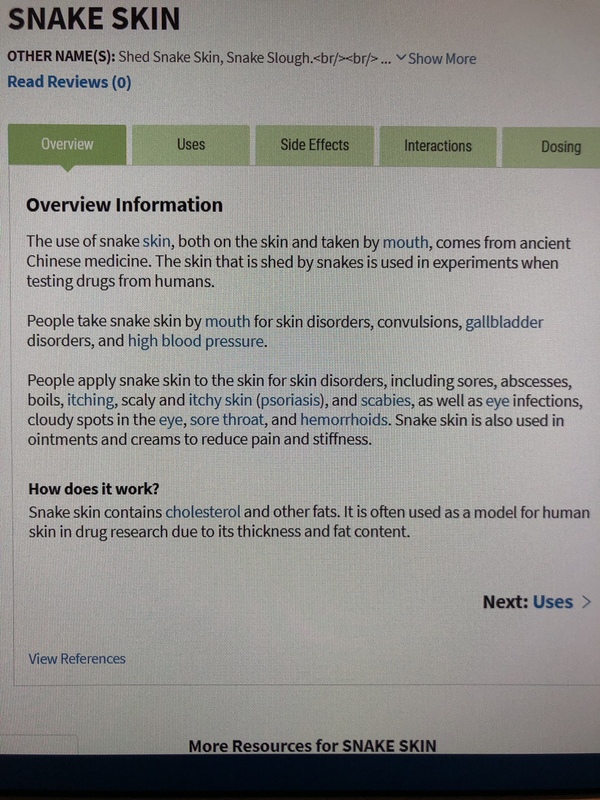 But just because the Chinese use something as "medicine" doesn't mean it actually works... I remain skeptical for most of their "cures" (though not all). what germs you're adding to your wound??? I can see the whole “art” aspect but ingesting it?? I would need to see some case studies on “test subjects” before plopping a chunk of ole Monty’s dead flesh into my pie hole. Ohhh this would actually kick up your “meet & greet” sessions to a whole new level. For sure...need to hand out barf-bags! At least they won't be bored! People meeting snakes are never bored. But just think how much fun snake skin "horderves" would be!